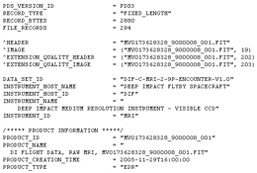 In order to properly archive the data from the Deep Impact mission so that other scientists can also use the data, the science team had to calibrate the date and create labels for each image following a set of standards developed by the Planetary Data Systems, the NASA body that archives the mission data. This involves describing each scientific data file. The description is an ASCII text file called a PDS data label. One label must be written for each data file in an archival data set. 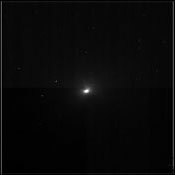 For example, the PDS label for an image of comet 9P/Tempel 1 taken by the medium-resolution CCD camera (MRI) on the Deep Impact flyby spacecraft will include information about the start and stop times of the exposure, the length of the exposure, what filter was used, and much, much more.